Online dictionaries are abundant. But their biggest drawback is their dependence on an active internet connection. When the internet connection is down these dictionaries become useless. This is when offline dictionaries come helpful. So here I have compiled 5 popular and very handy free dictionaries for Windows. Wordweb is probably the best freeware dictionary out there. 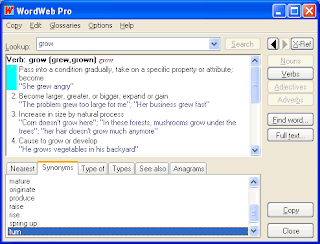 WordWeb is available as a powerful Pro version and a cut down free version. The free version is used by millions of people from all over the world, many of whom may not be able to afford a commercial dictionary. It sits in the system tray and can be launched from within any program. Wordweb by default integrates into MS Word and gives you a one click access to it from within Word. 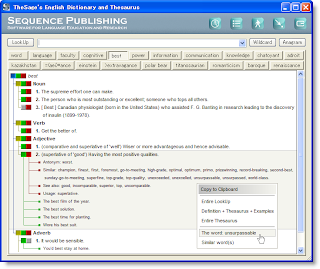 Apart from definitions, Wordweb shows you synonyms, related words and the root of the words. Wordweb has more than 150 000 root words and 120 000 synonym sets. TheSage can look up words directly from almost any program (IE, Word, Firefox, Outlook, Thunderbird, etc ) and is 100% portable. You can just copy it to your pen drive and take it along with you. TheSage allows you to look up words directly from most applications, offering multiple detailed definitions each coupled with its own thesaurus. 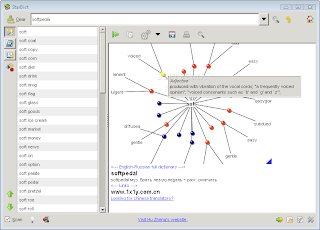 It has over 145,000 references with multiple detailed definitions (over 200,000) and a complete thesaurus with nearly 1,200,000 relationships between definition. TheSage has a tabbed interface, which is a rage these days, and supports wildcard search which is extremely helpful. Stardict is a free open source off-line dictionary program that allows you to use all those free dictionaries (at the moment more than 100 dictionaries are available). StarDict is just a dictionary shell, so when you download it you have no dictionary that comes along. You have to install dictionaries yourself. Stardict supports an interesting search concept called Fuzzy query. When you can't remember how to spell a word exactly, you can try StarDict's Fuzzy query. It uses "Levenshtein Edit Distance" to compute the similarity between two words, and gives the match results which are most similar to the word that you input. To create a fuzzy query, just input the word with a beginning "/", and then press Enter. Everest Dictionary has a total of 35 dictionaries available to date. It's possible to search words across multiple dictionaries. It also monitors the clipboard; in any program, a simple copy of the word to the clipboard using "Copy" command will launch the automatic search of the word in the dictionary. tinySpell is not exactly a dictionary, it's a spell checker. The reason I've included this on my list is because we often look up a dictionary not to learn it's meaning but to check it's spelling, don't we? The most useful feature of tinyspell is it's on-the-fly spell check. tinySpell can watch your typing on the fly and alert you whenever it detects a misspelled word. It can also check the spelling of text that you copy to the clipboard. tinySpell installs itself in the system tray for easy access. It comes with an American-English dictionary containing more than 110,000 words. tinyspell is a must have addition to your (already cluttered) system tray. I have to say also, that I am very thankful for the post. It is very difficult to find off-line dictionaries and application-independent spellers. WordWeb is perfect for me, thank You very much! WordWeb is not free. It is a 30 day trial. I've been using WordWeb for the last 2 years, and it has always been free. Thanks for the post. I used to use an online dictionary, but I can not use it when my computer gets offline. Now I can use WordWeb. Thank you so much. Thanks for the post! It was useful. ' was looking for an offline dictionary. I will try it to use whenever my computer is off line.But it will more difficult to get dictionary with audio . Thank you for the info. Free version of TheSage seems to be a nice one. I had the WordWeb with pronunciation capability installed before and this one has a nicer interface but no voice. Great apps anyways. Thanks again. You can also download Pocket Oxford dictionary. Microsoft Works came installed on my computer and an excellent dictionary programme was included with that. Problem is, when I upgraded to Win7 Pro I cannot find a download anywhere on the web. Works Dictionary was something I pinned to the taskbar and was the msost-used programme on my PC. Thank you for sharing.I've been searching for this so long. StarDict dictionary can't be downloaded(Instead the so directed site offers other downloadable dictionaries ).Wordweb and Sage's are awesome.Tinyspell is also good. Everest Dictionary also fine. Overall the Collection of 5 Free Offline Dictionaries are MUST GIVE A TRY softwares. Thank you to the entire Site owners. offline dictionary does not function when am off internet. Braina - http://www.brainasoft.com/braina/dictionary.html is the best offline dictionary with both speech recognition and audio pronunciation. It also shows synonyms, antonyms, word super-set, sentence usage examples and much more.